An unlikely pair of robots and opera singers teamed up for the U.S. debut of "Death and the Powers: The Robots' Opera" in Boston Friday night. The brainchild of MIT Media Lab professor and composer Tod Machover , the show centers on a man, Simon Powers, who is tired of the physical world, but still wants to remain there digitally. He downloads himself into The System and from off stage continues to interact with other characters through robots and walls that move and light up through a technique that Machover calls disembodied performance. To see the operabots in action, watch the video on YouTube. From an isolation booth in the orchestra pit James Maddalena , the baritone who plays Powers, is attached to a variety of sensors that measure his muscle tension, gestures and breathing. "So we take these measurements, translate them and send them onto the stage," Machover explained. "His behavior controls everything that happens on the walls, the look, the lighting and the way things move. It controls the way the robots move quite a bit of the time too." "We wanted to make robots that exhibit communication and emotion, but didn't look like human beings," said Machover. 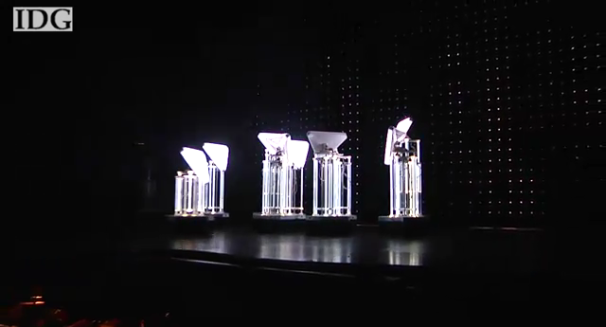 The operabots have triangular bases and heads and are made of plexiglass and metal. They have omni-wheels on each of their three corners so they can move forward and sideways without having to turn like a car. "They have really sophisticated wireless controlling so they can communicate with the controller and with each other," Machover said. Sometimes the bots are controlled off stage with an Xbox controller, whereas sometimes they listen to the orchestra and react to the music being played. The opera plays in Boston at the Cutler Majestic Theater until Friday, March 25, and then moves on to Chicago.